This article is about the traditional Samoan watercraft. For the James Wharram fishing catamaran design, see Amatasi 27. 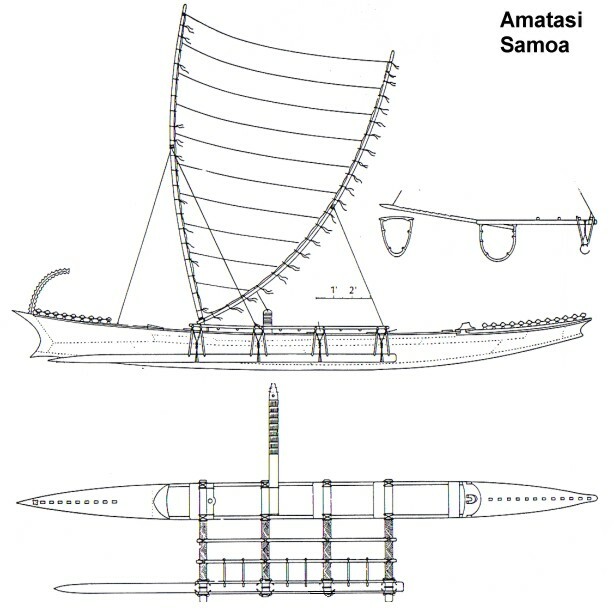 Amatasi are a type of Samoan double outrigger canoe watercraft. Its sails were woven pandanus leaves tied to 2 spars. The hull was sometimes built of planks. Lashed together, large double canoes 30–60 feet (9–18 metres) long could carry 25 men on journeys of hundreds of miles. ^ a b "Polynesian sailing vessels: Amatasi of Sāmoa". Polynesian Voyaging Society Archives. Retrieved 12 January 2015. The amatasi had sails made of woven pandanus leaves tied to 2 spars. The hull of the pictured amatasi is the va'a alo built of planks to hunt bonito fish.It is a swift, deep-sea vessel. Lashed together, large double canoes 30-60 feet long could carry 25 men hundreds of miles in the Samoa-Tonga area. From a 1972 calendar in the Archives. ^ Taonui, Rāwiri (22 September 2012). "Canoe navigation - Waka – canoes". Te Ara - the Encyclopedia of New Zealand. New Zealand Government. Retrieved 12 January 2015. "Historische Proas - Ancient Outriggers (2): Plan drawing of an amatasi". multihull.de. Retrieved 11 August 2016.